← Review: Until The Dawn, Mountain Hideaway, & With This Ring? 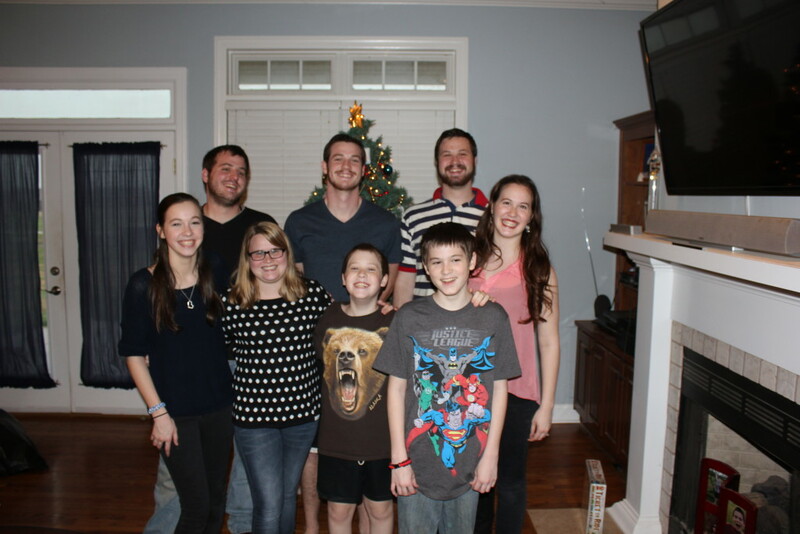 back row: Kyle (24), Caleb (18), Daniel (22) front row: Deborah (15), Carla (Kyle’s girlfriend), Adam (11), Stephen (13), and Elizabeth (17) — for height reference, Daniel is 6’5″. Parenting doesn’t get easier, but it does change. The worries and prayers change. The relationships change. Parenting doesn’t get easier, but it does change. You get a few good years, and then they hit the teens and puberty. They want to exert their individuality, take on new responsibilities they may or may not be ready for (can anyone say driving? ), and generally practice being their own person. Sounds a lot like the terrible twos. And it is. Then they settle in to who God made them to be for a few years, if you’re lucky. They stay up late, and sleep as late as you let them. At some point, they grow up–it really depends on the child. And then they start making their own decisions without any input from Mom and Dad. Sometimes you agree with their choices. Sometimes you don’t. It’s the times that you don’t that are the hardest. Should you say something or stay out of it? I don’t have the answers. I wish I did. Now, don’t get discouraged. Somethings are better. It’s gratifying when they make awesome decisions. They start paying for their own stuff. You can have grown-up conversations with someone besides your spouse or best friend. They can help with meals. And if you’re in the middle stage, what do you enjoy most about your pre-teen or older teen? And finally, if your children are grown, what things do you enjoy most?